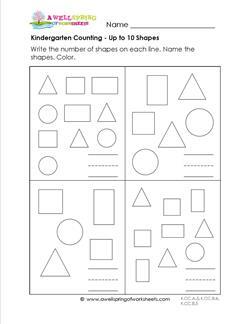 These kindergarten counting worksheets have the basic shapes of squares, circles, rectangles, and triangles. 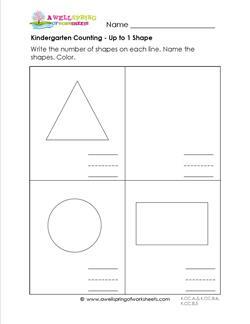 Each worksheet has four sets of zero to ten shapes for kids to count and a primary writing line to write the number on. 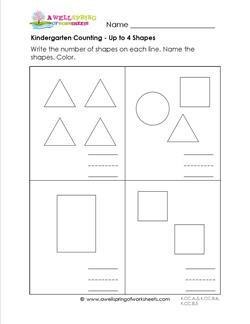 The number of shapes on each worksheet increases as you scroll down the page. Use to compliment your geometry lessons. 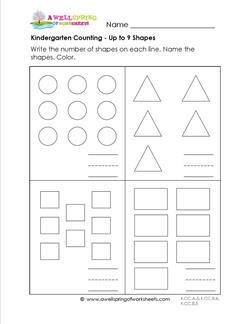 Have kids say how many of each shape and the name of the shape, “four triangles”, “three circles”, etc. for practice using verbal skills. 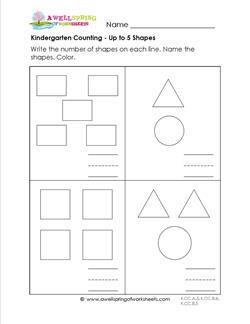 This kindergarten counting worksheet starts out real simple - with zero or one object per set. Write each number on the lines. 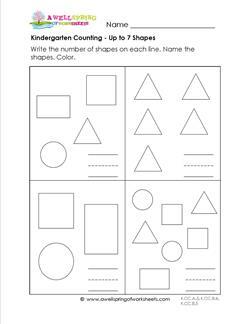 Easy kindergarten counting can be found on this worksheet! Each set has zero, one, or two shapes. Count, write the number, and color. Kindergarten counting is coming along with one, two, or three shapes per set. Count each shape, write the number, and color. Review already learned kindergarten counting skills of counting to 1, 2, and 3, and now add counting to 4, too! Write the number and color. 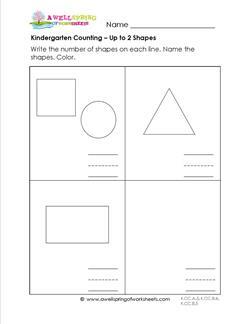 You've counted 2, 3, and 4 shapes in these kindergarten counting worksheets, and now it's time to add counting to 5, too! Write and color. Check out these shapes! 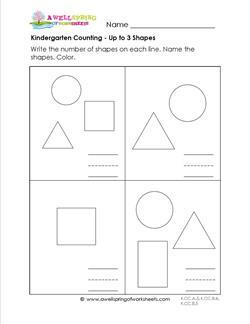 Count up to 6 shapes in each set. Write the numbers on the lines. Color each shape a different color. And now you have reached the magic number of 7! 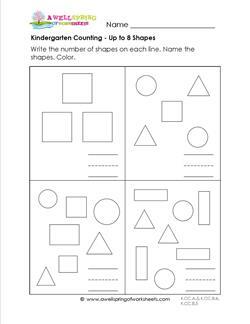 Count up to 7 shapes per set with this kindergarten counting worksheet. Kindergarten counting is getting a bit more challenging now! Count up to 8 shapes in each set (WOW! ), write the numbers and color. It's taken baby steps to get to this kindergarten counting to 9 page, growing and learning along the way, now show what you can do! At last you've reached kindergarten counting to 10! 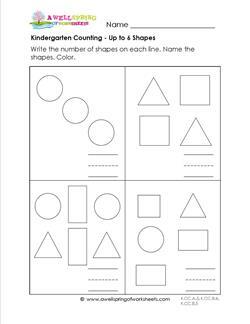 Great job counting from 1-9, now apply those skills to this worksheet, too.